From today, 23 September, customers can place orders for the fully electric Volkswagen e-Golf, which is priced at €32,660 (including €5,000 SEAI Grant and €5,000 VRT Rebate). Based on the multi-award-winning Golf hatchback, the e-Golf offers the same virtues of practicality, refinement and advanced technology, but with a purely electric drivetrain and no tailpipe emissions. The e-Golf can be charged from a household three-pin socket using the cable provided. With a standard 230-Volt, 2.3 kW supply, this recharges the battery in 13 hours. An optional wallbox for home use provides 3.6 kW supply and can recharge a flat battery in eight hours. The wallbox is currently available at no cost, through ESB ecars. Through use of the e-Golf’s standard combined charging system (CCS) and a DC supply, the battery can be fully recharged (at levels of up to 40 kW) to 80 per cent capacity in just 35 minutes. An AC electric motor (85 kW / 115 PS, and 270 Nm) provides drive, linked to the front wheels via a single-speed gearbox. The lithium-ion battery is integrated into the Golf’s floor and weighs 318 kg. It consists of 264 cells, together rated at 390 Volts and 26.5 kWh. Acceleration from 0-100 km/h takes 10.4 seconds. By comparison the Golf BlueMotion, which is powered by a 1.6-litre turbodiesel engine with 110 PS and 250 Nm, takes 10.5 seconds. Top speed for the e-Golf is 140 km/h. Depending on driving style, charge level and ambient conditions, the e-Golf has a range of up to 190 km. There are considerable savings to be made for customers whose driving habits suit an electric vehicle such as at the e-Golf. For example, the e-Golf can cost as little as €1.27 per 100km, compared to €5.77 for the equivalent 1.6 diesel Golf, or €7.80 for the 1.2 TSI petrol Golf. That is an up to 78% fuel saving versus a diesel Golf and an up to 84% saving versus the petrol Golf. An optional heat pump (€1,004) helps deliver maximum range in winter. This add-on module for the electric heating and air conditioning uses heat from both ambient air and the vehicle’s drive systems, significantly reducing electricity consumption. 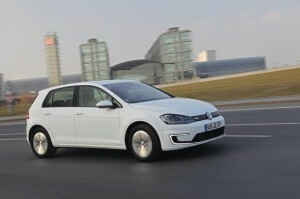 It can increase the e-Golf’s range in cold weather by up to 20 per cent. As well as a standard driving mode, the e-Golf has two economy profiles: ‘Eco’ and ‘Eco+’. ‘Eco’ cuts peak power to 70 kW / 95 PS, reduces the output of the air conditioning system and modifies the accelerator response. Top speed is cut to 120 km/h and 0-100 km/h takes 12.1 seconds. ‘Eco+’ limits maximum power to 55 kW / 75 PS, torque to 175 Nm, and top speed to 90 km/h, while the accelerator response is modified and the air conditioning disabled. In either mode, full performance can be accessed by kicking down on the accelerator pedal, as in a vehicle with a conventional automatic gearbox. The e-Golf’s range can also be influenced by regenerative braking. There are five modes: D, D1, D2, D3 and B. In D, the vehicle coasts without regenerative braking when the accelerator is lifted. In each other mode, lifting off the accelerator pedal provides greater regenerative braking. In D2, D3 and B, the brake lights are activated when the driver’s foot is lifted from the accelerator pedal, provided that a predetermined level of deceleration is achieved. The e-Golf is the first production Volkswagen to feature full LED headlights. These produce brighter light and use less electricity than xenon headlights. Other bespoke exterior design elements include C-shaped LED daytime running lights in the front bumper, a signature blue strip running the width of the radiator grille and into the headlights, and a blue-edged Volkswagen roundel. The interior includes blue stitching on the upholstery, and the option of blue ambient lighting. In Ireland, the e-Golf is available with five doors only, and in a single well-equipped trim level based on the Golf Comfortline, with the addition of 2Zone climate control, front and rear parking sensors, e-specific ‘Astanta’ alloy wheels and Discover Pro satellite navigation, with an eight-inch colour touchscreen. For the e-Golf the Discover Pro system includes added functionality including a range display, and the option to pre-programme the vehicle’s heating or cooling systems. Available from the end of the year for smartphone users (Android or iOS), the Volkswagen ‘Car-Net’ app enables many vehicle functions to be controlled remotely, including charging, heating or cooling and more. 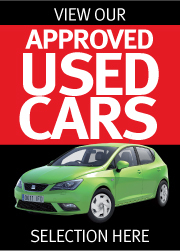 One years’ subscription to Car Net is included as standard. The car will be on display from this week and available for test drives in Frank Keane Volkswagen Long Mile Dublin, who will be the authorised e-Golf retailer for Ireland.